Sheppard’s Pie is one of my favorite dishes. Since now we are in fasting period I decided to change the recipe into a vegan one. The result was pretty good considering the fact that I did not use any butter or cheese in it. 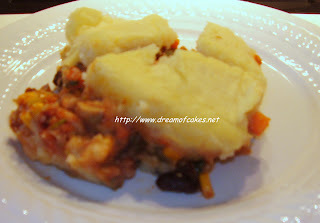 My first thought was to name this recipe Sheppard’s Rainbow because of all these colors, but then I thought that spring includes everything so I named this recipe Spring Sheppard’s Pie. Below you can see in detail photos of this dish. 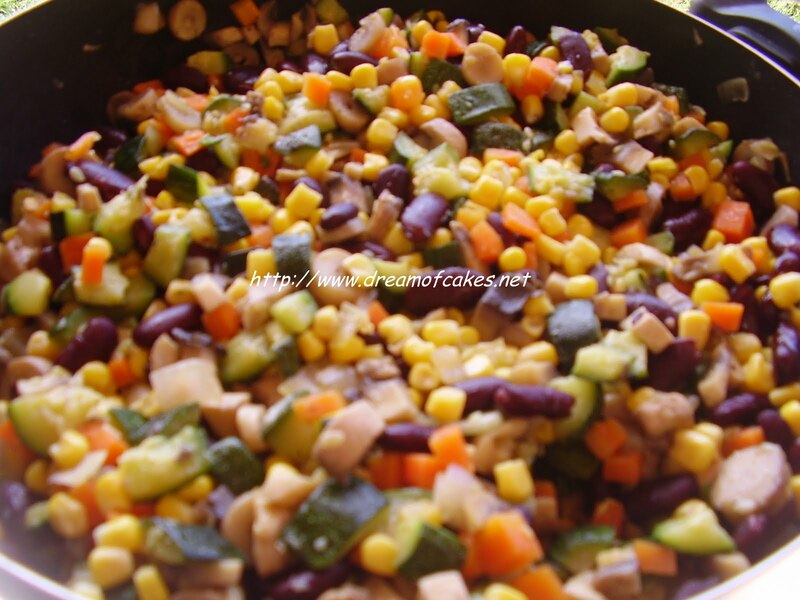 It is quite easy to make so if you like vegetables give it a try. I am sure you will like it. 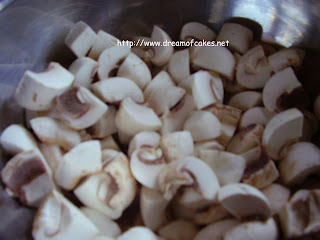 Cut mushrooms into small quarters. In a deep fry pan lightly fry separately the zucchini, the carrots, and then the mushrooms with the onion. 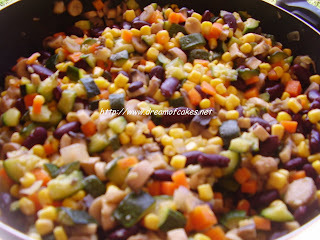 In the same fry pan add together the mushrooms, zucchini, carrots, onion, sweet corn, red beans and the tomato juice. Season with salt and pepper. Allow to boil for a few minutes until there is no liquid in the fry pan left. Then add the chopped parsley. Lay the vegetable mixture on top of the mashed potatoes. Then, on top of the vegetable mixture lay the other half of mashed potatoes, sprinkle some tablespoons of olive oil, and bake in a preheated oven at 200ºC, for 20 minutes. Serve hot or cold with a salad of your choice. 1. 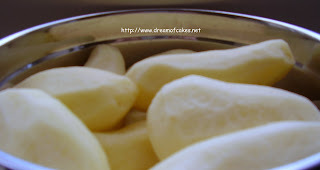 Peel and cut the potatoes into small pieces. 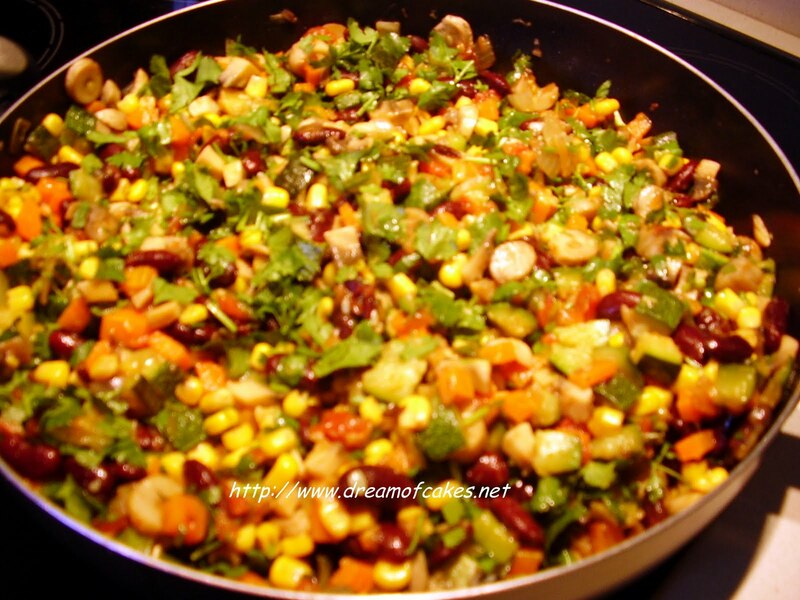 In a large sauce pan dissolve the vegetable stock in hot water, add salt and pepper. Then add the potato pieces and boil until they are very well cooked. 2. Mash the potatoes; add the soya milk and mix well. 3. Divide the potato mixture into to two equal portions; lay the 1st portion in a Pyrex oven pan and set aside. Cover the other half with a clean film. 4. 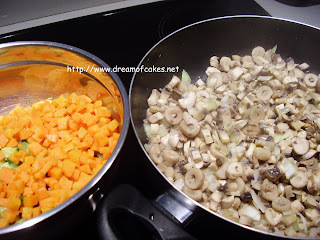 Cut the mushrooms, zucchini, carrots and onion into small quarters. 5. In a deep fry pan lightly fry separately the zucchini, the carrots, and then the mushrooms with the onion. 6. 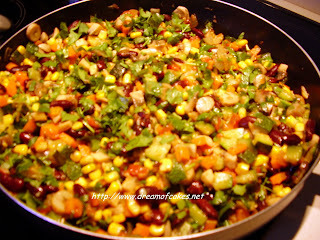 In the same fry pan add together the mushrooms, zucchini, carrots, onion, sweet corn, red beans and the tomato juice. Season with salt and pepper. Allow to boil for a few minutes until there is no liquid in the fry pan left. Then add the chopped parsley. 7. 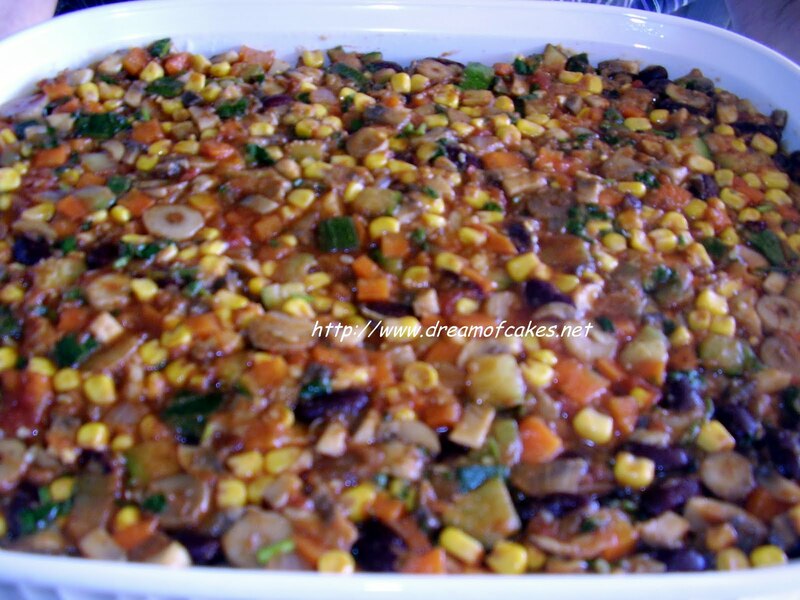 Lay the vegetable mixture on top of the mashed potatoes. 8. Then, on top of the vegetable mixture lay the other half of mashed potatoes, sprinkle some tablespoons of olive oil, and bake in a preheated oven at 200ºC, for 20 minutes. 9. Serve hot or cold with a fresh salad of your choice. That looks great! So colorful and healthy. Wowowowo, looks so good and healthy too . I made beef pie once. That was little rich for me. What a delicious way to turn a Shepherds Pie into a dish us non - meateaters can enjoy. It has always been one of my favorite dishes. I remember going to school in England and they used to serve it as a lunch dish. You don't get that kind of meal in high school in the US. very nice my son loves this! 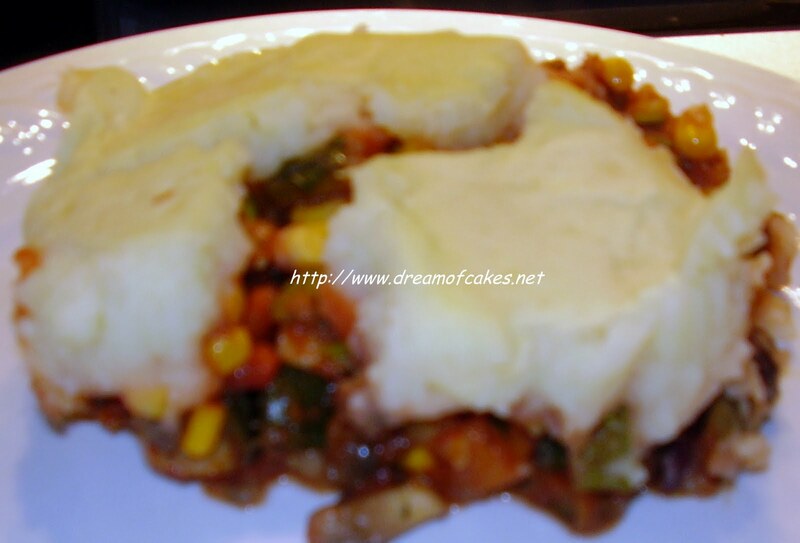 I like this vegan option to Shepard's pie. I enjoy meat, but don't like to eat it all of the time. This sounds like a great way to get the comfort of the pie without the extra calories of the meat! Thanks! Lent is the time we get the most creative. I would definitely prefer this vegan pie any time. Shepherd's pie is such a lovely comfort food. That looks delish!!!!!! I can't wait to try this recipe! Looks amazing! 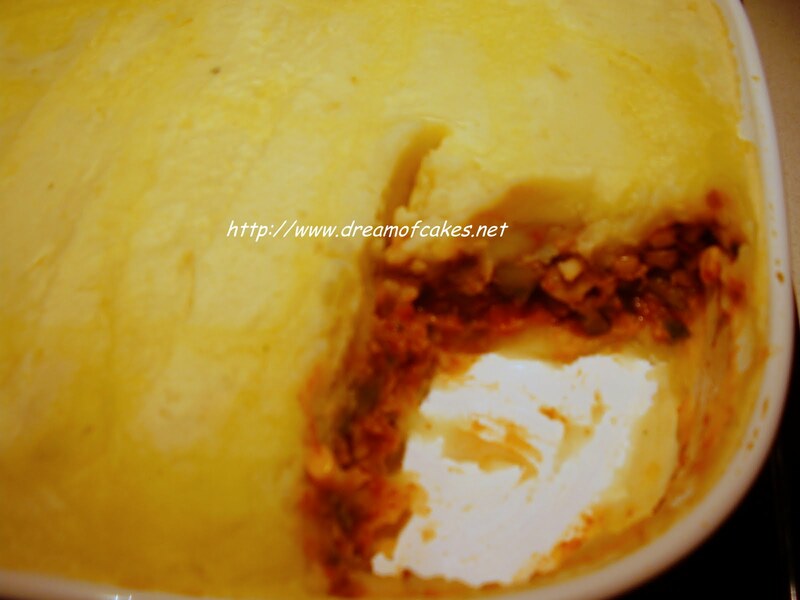 I love Shepherd's Pie! 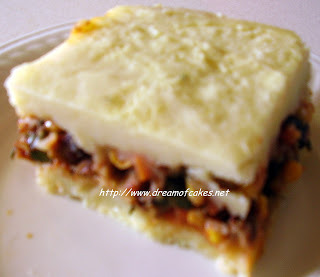 I don't eat meat but always wanted to try shepherd's pie-this is ideal! Thank you for a great recipe!